amily movie night. We usually have a movie night once a week, but this week something struck me. We were sitting in front of the tv watching the film, but our faces were buried in our phone or tablet while the movie was playing. Breakfast table. We sit down to eat breakfast and both have our phones sitting on the table. When the conversation has a lull or we feel bored, we can just pull up the screen on our phone to fill the silence as we munch on a piece of toast. Do either of these scenarios sound familiar to you? Screen time can so easily creep in and create division between spouses. When we’re bored, uncomfortable, or want to isolate ourselves, there’s an easy distraction right at our fingertips. Technology can be fun, provide a lot of entertainment, and provide a great way to keep in contact with others. The problem comes when we start engaging with our screens more than our spouse. We have to be aware of how technology is impacting our marriage so that it doesn’t create wedges. But how do we keep healthy boundaries on technology in the midst of our marriages (and, if necessary, break the bad habit)? Intentionally have dinner together, turn your phones on silent, and keep them off of the table. By keeping them off the table, we remove the distraction. Having dinner together is a great way to connect with one another after a long day. Talk with each other, ask questions about your days, and take time to connect. When we were first married, our routine became work, Netflix, bed. With money being as tight as it was and with the problems we were facing, TV became our saving grace. We were absolutely exhausted at the end of our work days and TV was all we had the brain power to do…it also became a great way to ignore our problems. With a show on, we didn’t have to talk or engage with one another. After we started our crisis counseling, we knew that we needed to change our routine. We decided that we Monday through Friday we would leave the TV off. We found that with this rule, we started to have more fun together. We started playing games, going on walks, and becoming creative with ways to fill our time together. Take time to talk with your spouse without the distraction of your phone. Adam and I love to go for walks or sit and have a cup of coffee so that we can take time to talk. During this time, we put our phones away, out of sight. Before reaching for your phone in the morning, kiss your spouse and tell them that you love them. Your spouse needs to know that they are more important than your phone. Have your quiet time or take time to pray before reaching for your phone after you wake up. While not everyone has their quiet times in the mornings, we should be setting our hearts and minds on what matters most at the beginning of our day. By taking the time to connect with the Lord before our phone, we are setting our priorities correctly. This may seem like a crazy notion, but take a weekend away as a couple and intentionally turn your phone off for the WHOLE weekend. Give the number of where you are staying to those who will need to get ahold of you in the case of an emergency, but leave your phone off. This will allow us to fully focus on our spouse and connect in a new way. Adam and I do this every few months to intentionally focus on one another. If we fill our time with enjoyable things, then we can begin to separate ourselves from the hold that technology has. Take a dance class, a cooking class, take up running…get creative. Choose a place that is not right next to your bed to put your phone while you’re in bed. We have our phones in our bedroom, but on a table in the corner so that they can charge overnight. This keeps us from having them right next to us in the middle of the night or in the morning when we wake up. They’re also programmed to automatically silence all calls and notifications from 8:00 PM to 8:00 AM. That’s our time as a couple. Technology is a great place to escape when we want to distract ourselves or if we‘re uncomfortable. It automatically gives us something to do with our mind so that we aren’t just left with the company of ourselves and our emotions. Rather than reaching for your phone, allow yourself to think about what you’re feeling. If you’re happy, savor it, if you’re not, dig a bit deeper and share with your spouse. This is a difficult one, but ask your spouse if they feel that they are second to your phone. Open the conversation. Be willing to listen as they share how they feel. And if they feel left out, start to make changes so they don’t. It took time for us to feel comfortable putting away our phones. The first few weeks felt like torture as we were trying to find things to do or to find things to talk about. The transition took a while, but now we barely find ourselves watching TV and we are easily able to put our phones away. We still struggle sometimes, but the more we’re able to disconnect from technology, the more we feel connected to one another. 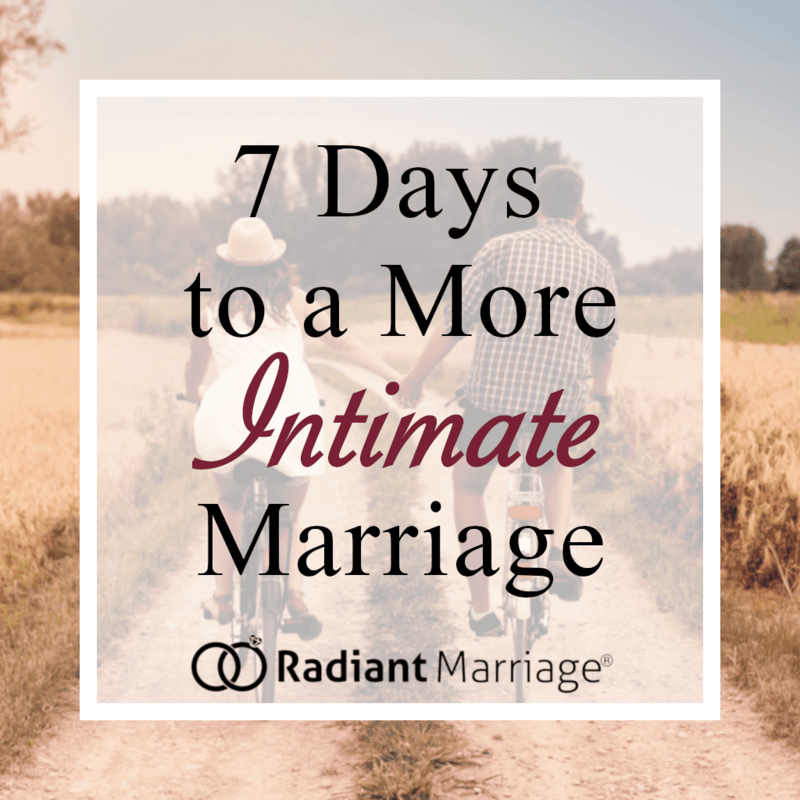 What this all comes down to is being fully present with your spouse. When we are fully present, we open the door for intimate connection. Hey, I was just reading Hold the Phone: How to Keep Technology from Taking Over Your Marriage from RadiantMarriage.com and thought you might like to read it. Let me know what you think!